Elliott Wave Technology. 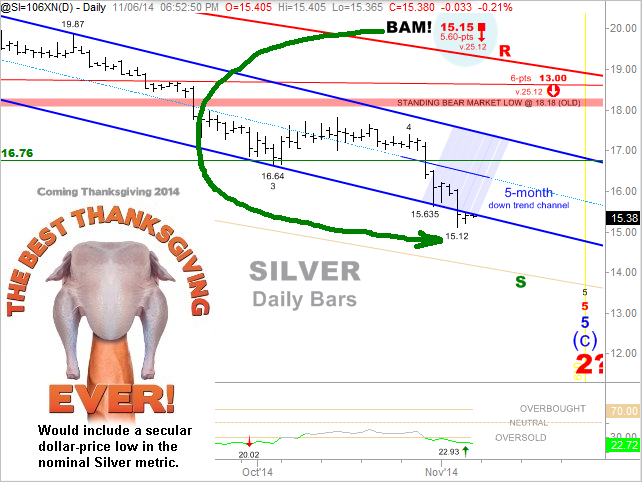 Automated Trading and Investment Strategies: SILVER: Here Comes Lucky 13? SILVER: Here Comes Lucky 13? After breaching the lower boundary within a clearly defined 5-month down trend channel, Silver is now struggling to get back above that lower rail. Nearly a year ago, when silver was trading near $21 per ounce, (26% higher than it is today) we identified a downside price target of $15.15 per ounce. As evidenced clearly in the below chart, we captured this target on Wednesday November 5, 2014 – with only 0.3 cents to spare. Still outstanding, and the last downside price target we have on public record remains at $13.00 per ounce. Despite registering lower lows from our previous update, for now, a bullish momentum divergence persists. If the bullish divergence holds, it is likely to spark a short-term rally in the very near future. We’ll see how that plays out going forward. 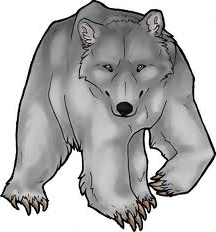 Until then, it is what it is, a bear market – deal with it accordingly. Do you think that your investment/savings portfolio can improve with such guidance? Whatever your timeframe and objectives, we have prudent and effective solutions without all the hype and bull. Via real-time email alerts and daily PDF reports, the Chart-Cast Pilot conveys actual positions taken within the portfolio. Updated quarterly with unlimited email alerts as market conditions dictate, the Long-Term Trend Monitor provides the exact same type of service - but is dedicated exclusively to the self-directed long-term index investors of the equity and precious metals worlds.